Genre: Action/Adventure. Other versions: PC. There was a time once when vampire themed entertainment wasn’t about slushy teen romance, brooding, morose undead pin-ups and women oblivious to the fact they are in love with a cold-blooded instinctual murderer. 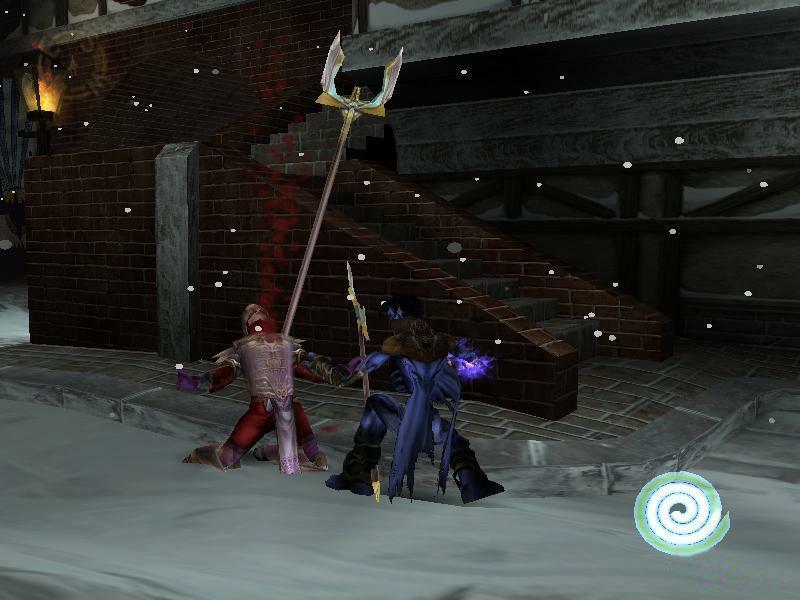 Thankfully, the classic vampire prose of legend and terror remains intact in the Legacy of Kain series, albeit with a more thespian-esque gothic dialogue. Continuing the events of Soul Reaver, we are once again guiding the tortured ghoul Raziel, in his quest for vengeance and absolution. 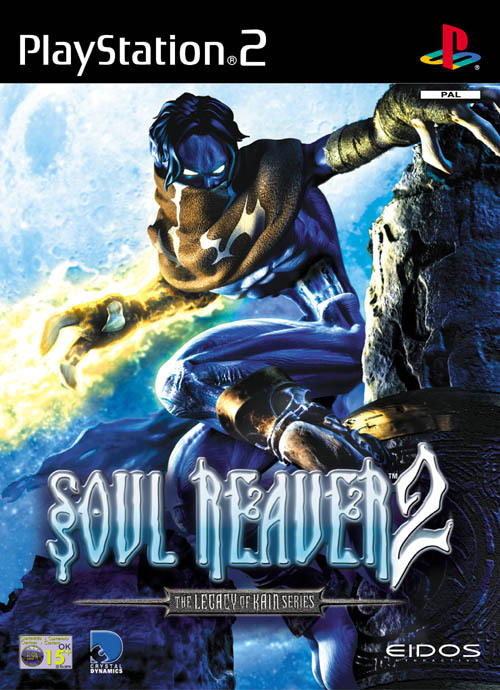 The third instalment in the franchise, Soul Reaver 2 takes on a more story-driven guise, expanding our blue skinned anti-hero’s goals within an intricate tale of morality, fate, destiny and causality. The land of Nosgoth has never felt more atmospheric and haunting, with a storyline of almost Hollywood magnitude. This game certainly administers a large bite, leaving a mark of thought-provoking, head-scratching proportions, but any hopes of perpetual vampirism are quashed after only a few nights of spectral-shifting, as the thirst for blood sadly and disappointingly vanishes too quickly. With the finale of the previous adventure ending in a frustrating cliff-hanger, we are immediately thrust back into the lands of Nosgoth, only this time the medieval gothic locale is gravely enhanced and more atmospheric then ever. An impressive introduction sets the standard for the cut-scenes that occur at regular intervals throughout the game, either fully rendered or in-real time. Whilst important to the plot, these cut-scenes crop up far too often; half of the opening 30 minutes of the game equates to just watching the scenes play out. Some may dislike this as it does tend to become vexing. 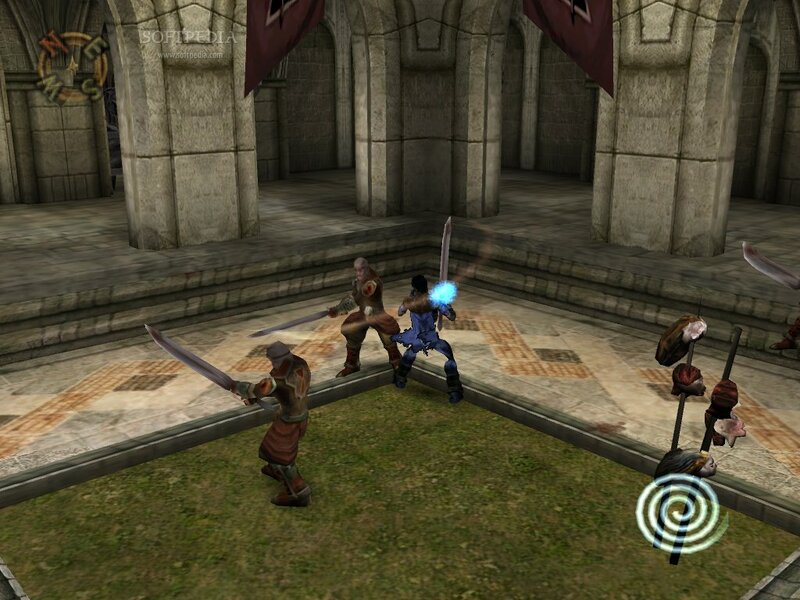 However, they become less frequent as the game progresses, with more lengthy FMVs between long spells of gameplay. Another possible turn-off for the, shall we say, non-wordsmiths is the articulation and vocabulary spoken by the central characters. Dialogue is extensively intricate, swiftly spoken and sometimes perplexing, which makes following the story a bit tricky on occasions. This does create strong personas for the protagonists certainly, with very fine voice acting of the archetypal thespian ilk across the board, particularly for Raziel and Kain’s discourses. They do tend to drag on, containing far too many clever words when things could be said more simply and abruptly. The excellent but sometimes convoluted story is played out beautifully in this manner yes, but this does hamper the fluidity of the game somewhat. Visually, said cut-scenes are some of the finest I have seen on the PS2, and this marries well to the general look of the whole game. The Sarafan stronghold is foreboding, as are the underground sections and temples, and Nosgoth itself it highly detailed. Lighting and weather effects create a nice ambience, but some sections become too dark, making progress needlessly difficult to navigate. Primary figures are excellently rendered, as are many of the enemies, water features and assorted environmental furniture. For the most part, the default camera angle is also admirable and behaves well, but on the odd occasion it can become too closed in, making hidden or peripheral objects awkward to see. This aside, everything fits the mood and is a delight to observe, especially when shifting into the spectral realm. 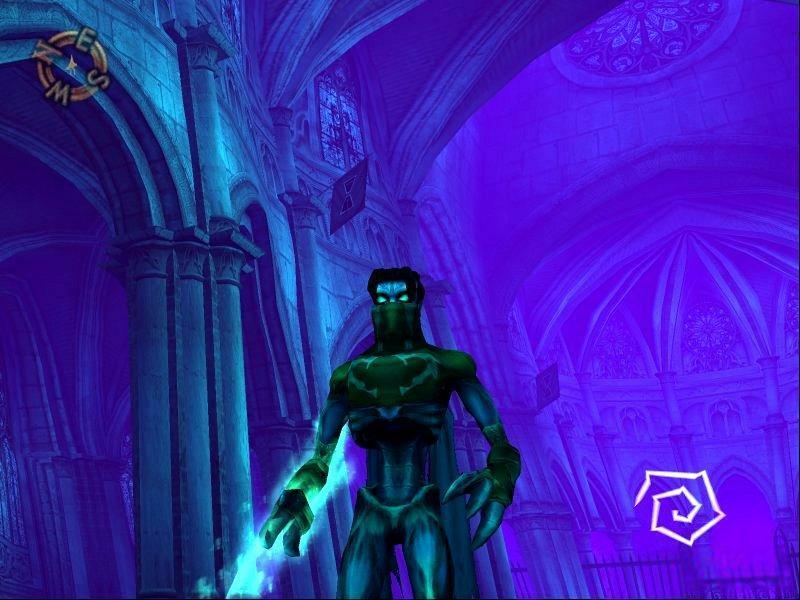 This looked impressive in Soul Reaver; now it’s a genuine highlight, with the twisting, morphing surroundings adding a touch of ghostly creepiness. This all creates a more ominous mood, but not all-out frightening, and coupling well with the wide range of control you have over Raziel’s view of this sinister world. Furthermore, there are no loading times between transitions, so the pace stays constant and engaging. Not wanting to play second string to the graphics; the sound effects, voicing and dramatic music stand out brilliantly, a real high point for the franchise. The BGM can be very subtle, but builds tension expertly and culminates at times of intrigue, attack or terror. The effects likewise are numerous and apposite, with changes to the surfaces you walk on, ambient background sounds to the demonic howls and the unsettling shrieking of the soul reaver. As already mentioned, the voice acting is top-grade, each actor really fleshing out their respective characters. Raziel’s skeptical sarcasm, Kain’s sinister revelations and Moebius’ cunning trickery all individualise each personality, adding to the richness of the storyline and influencing how to feel whilst playing the game. And it’s not just the story that garners acclaim. The faithful mechanics of the previous titles’ are carried over with a few tweaks and additions. 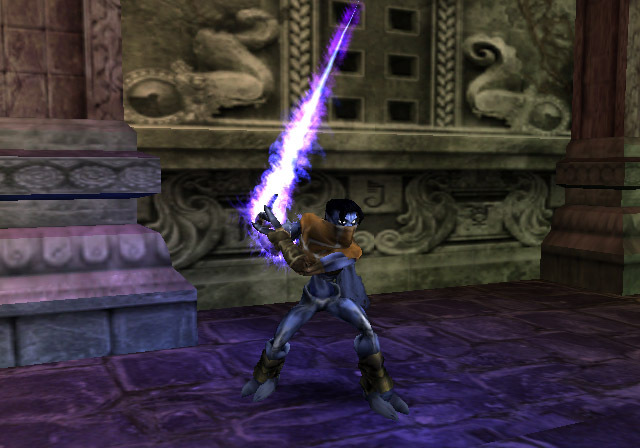 A full gamut of movements is gratifyingly available to Raziel, including targeting the telekinetic energy of the soul reaver, gliding through the air and of course his fighting skills. This time, enemies are a mixture of species not just of vampire lineage, and so can be dispatched via any means. Bare hands, axes and swords are all on hand to let the blood spill. A battle targeting ‘lock’ system and a mixture of attack types keep things varied. Unfortunately, these changes make the combating easier than before, just one part of the problem which makes Soul Reaver 2 not the great game it could have been. The fundamental puzzles of reaching locked passageways, gaining elemental powers or vanquishing large creatures range from simple to taxing, the latter normally using acute use of the spectral realm or the soul reaver, which does keep the challenge going for a while. 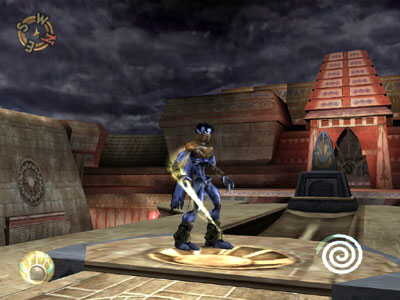 Other changes from SR1 includes that you can now summon the soul reaver regardless of health, (but it can now consume you if used incorrectly), there are dedicated save points to reach and of course, and most uniquely, you can never technically die. Depleted health in the physical realm takes you automatically to the spectral, and if drained here you will re-spawn at one of the ‘reaver beacons’ to continue your journey. Combined with the fact that you don’t have level bosses of a fashion, the gameplay is very forgiving, enjoyable and different to other 3D platformers. Whilst this is immersive initially, it has a detrimental effect to the games long-term appeal. This is the major issue. Under the attractive visuals, fine audio work, comprehensive plot and entertaining gameplay; there is just not enough of it! Three or four days of solid play and SR2 is done and dusted, and to make things worse there is little replay value thanks to its expected linear nature and overly lengthy FMVs. More content, more free-roaming and maybe a bit more challenge is needed to complete this impressive vampiric tale of fatalism and philosophy. It explains the holes left by the previous games, but still ends with a somewhat unfinished conclusion. The delights of soul feasting is a kick for as long as it lasts, but once it’s over, there’s a come-down which ultimately leaves you hungry for more with an unfortunate aftertaste of disappointment. Impressive stuff, but too little of it.